Nearly every culture on Earth has them. Some are boiled, some are steamed. Some are pan or wok fried. Some are dropped by the spoonful into a flavorful stew or broth. They are pinched, pleated, folded, formed. They are eaten with chopsticks, spoons, forks, fingers. They can be dipped or drenched in sauce, or left naked. From Italian gnocchi and Brazilian bolinhas to Mongolian buuz and Turkish manti, the ubiquitous dumpling - both sweet and savory - is a universal comfort food. 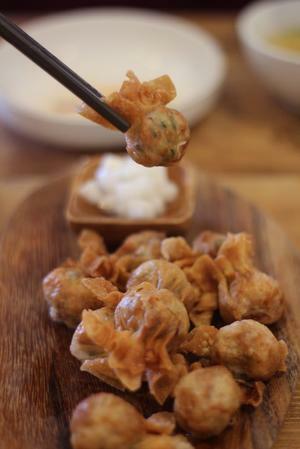 In Asian cuisine alone, there are over 20 different types of dumplings ranging in size, shape and method of cooking. I wanted to try them all. 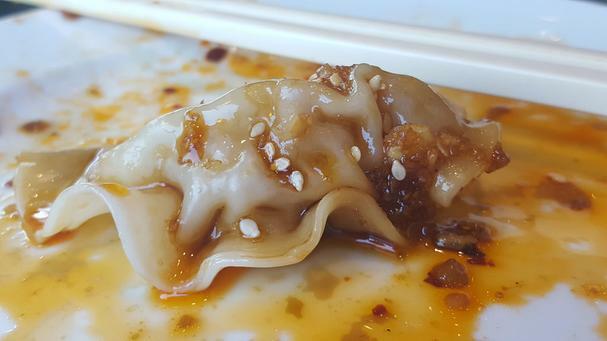 Richmond, British Columbia, a city that rightfully boasts of the most authentic Chinese food outside of China, is home to the newly launched Dumpling Trail. Located just north of the U.S. border and on the way to Vancouver, Richmond is a culinary destination with over 800 restaurants, most of which are Asian. 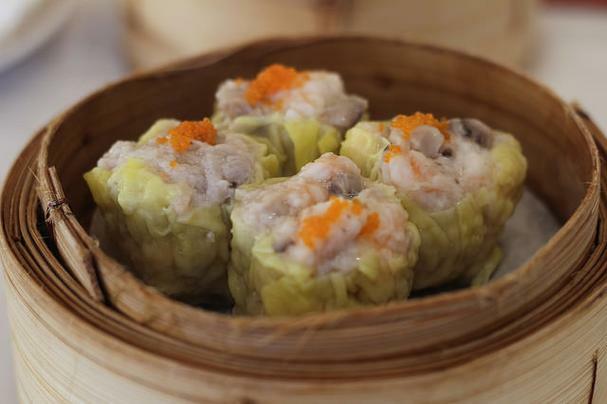 The 15 restaurants on the Dumpling Trail range from upscale banquet halls to hole-in-the-wall mom and pop gems, even food court stalls. 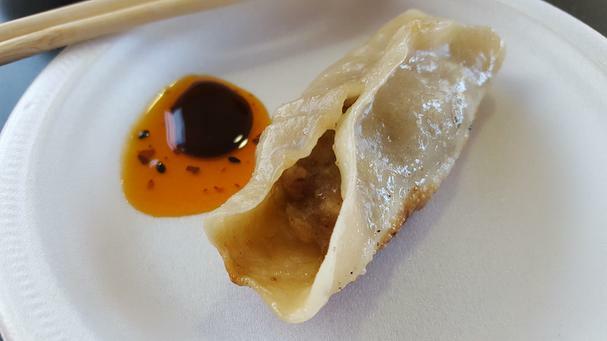 I recently had the opportunity to get a taste of what the Dumpling Trail has in its offering and sampled a number of delicious sweet and savory bundles from Korean, Japanese, and Chinese cuisines. All plates were under $8 USD and I went home satiated and with zero jet lag. Dumpling Trail Tip #1: Take cash! Most of the restaurants in Richmond do not take credit or debit cards, so be sure to bring cash. The good news is the food is cheap! My first stop was to Golden Sichuan Restaurant to sample their authentic Sichuan-style spicy water-boiled dumplings known as Shui Jiao. The variety I tasted were stuffed with a combination of minced pork, chives, shiitake mushrooms, and a firecracker pop of spicy chile peppers. 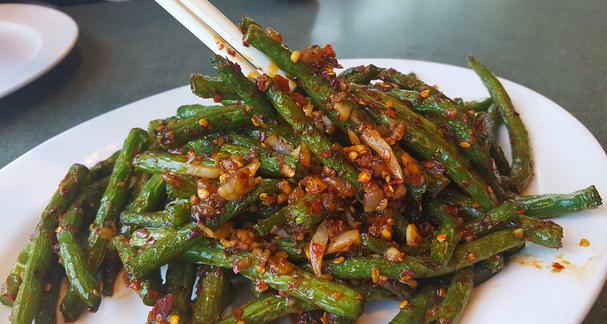 We enjoyed two slightly different styles of Sichuan water-boiled dumplings with a plate of beautifully crisp and spicy Sichuan green beans. 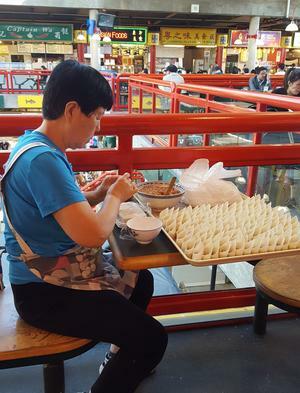 You could literally spend the day (or three) eating at the Richmond Public Market and sample dishes from all 8 regions of China. But my goal was to hit Xi’An (pronounced she-ahn) Cuisine to try their fried pork dumplings. 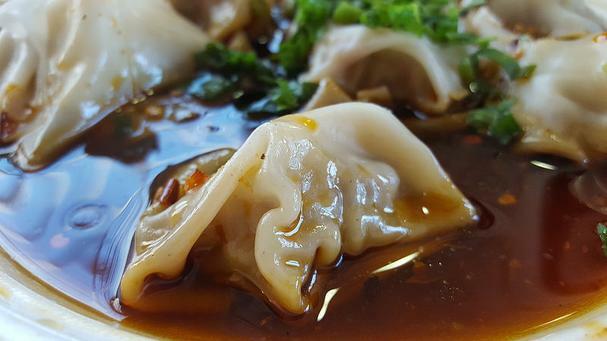 When the chef and owner of Xi’An, named after the capital city of Shaanxi Province, emigrated to Canada from China years ago he was unable to find a job in his trade, so he taught himself how to make the traditional dumplings and hand-pulled noodles of his home. 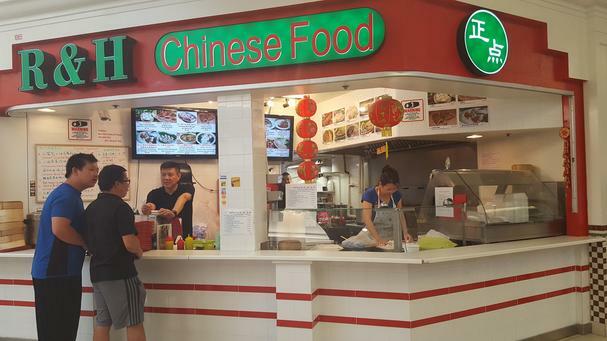 For 14 years he has been feeding eating enthusiasts his famous cuisine, so make this a must-stop on your dumpling trip. Dumpling Trail Tip #2: Get some greens with those dumplings! With so many scrumptious dumplings to choose from it’s easy to quickly fill up on meat, so add a plate or two of sautéed greens or crispy blistered beans to your order. Across the street from the Richmond Public Market and tucked away in a small complex is Samsoonie Noodle & Rice, a restaurant that features mandu, a Korean version of a Chinese dumpling. 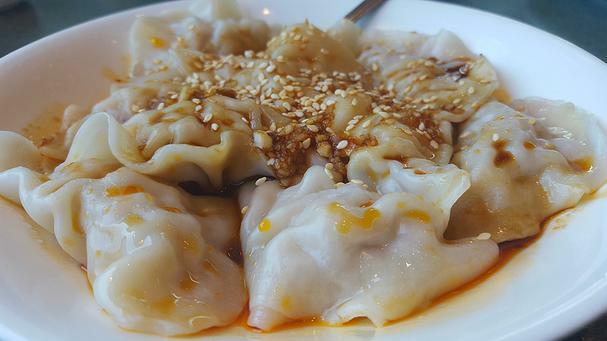 These dumplings are often filled with minced meat and assorted vegetables and can be steamed, boiled or pan-fried and are typically served with kimchi. 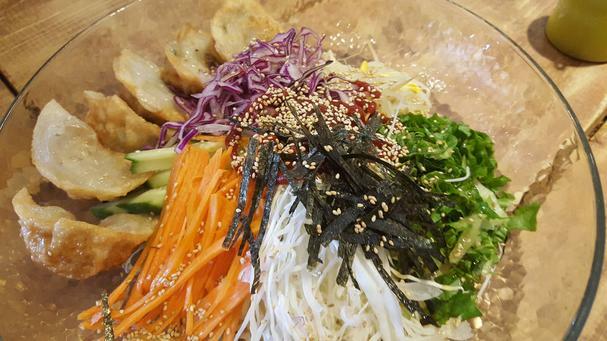 What makes the Spicy Fried Dumplings at Samsoonie so special is the mega-plate of beautifully julienned vegetable salad atop a pile of noodles that the dumplings curl up against. Toss it all up to incorporate the spicy sauce throughout and you have a meal that can easily feed two or more. I also tried these dumplings boiled (without the salad, at left) for a different variation, as well as the pop-in-your-mouth size mul mandu (at right), little pork, chive, egg, cabbage, and green onion-filled dumplings wrapped in round wonton wrappers then fried into quaint little pouches. 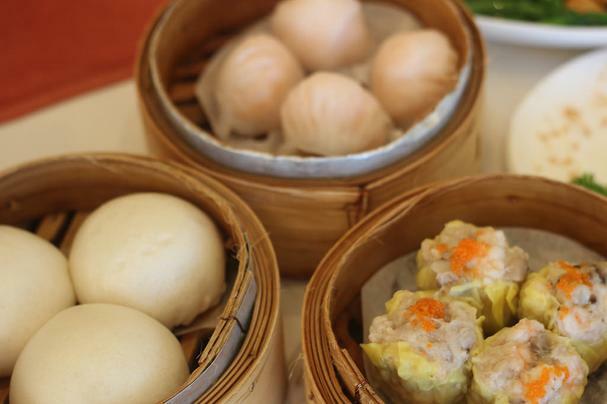 Dumpling Trail #3: Did you know that you eat dessert first when at a dim sum restaurant. The reason is that they make the sweet ones first thing in the morning and must be eaten fresh and hot. So while it goes against everything Mom ever taught you, go ahead and have dessert first. 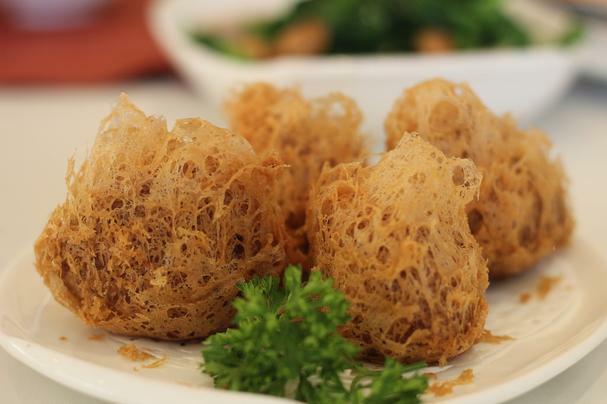 If you love dim sum, don’t miss the impressive assortment at Shiang Garden, an authentic banquet hall restaurant specializing in Cantonese cuisine. I was told the way to tell a good dumpling is by the meat and wrapper ratio and the quality of both. It shouldn’t be overstuffed and and the wrapper shouldn’t be too thick. 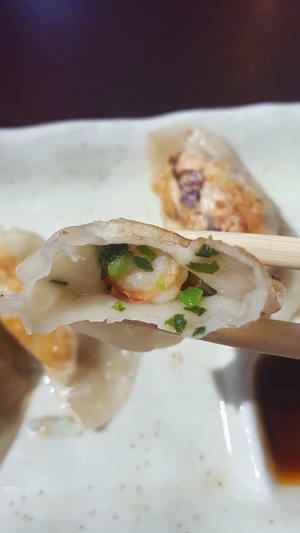 If the dumpling includes shrimp, the shrimp should have a nice snap to its texture, not mushy. 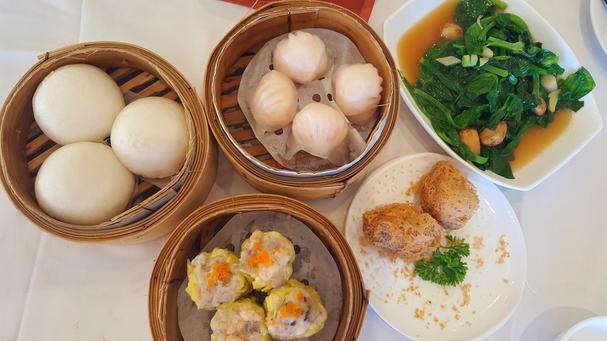 We ordered two of the most common types of dim sum dumplings to use as our “quality barometer” - Har Gow (shrimp dumplings, above) and Siu Mai (pork and shrimp dumplings, below). Both were perfect works of edible art. 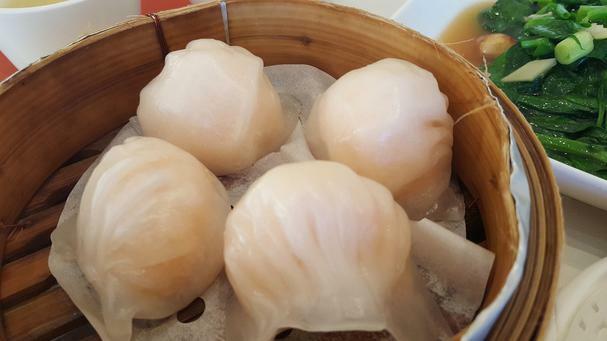 The beautiful translucent wrappers of the Har Gow offered a hint of the shrimp’s pink hue from within; the Siu Mai were proportionately filled with pork and shrimp and enveloped in tender, thin yellow wrappers. The shrimp in both still retained that fresh cold water snap. 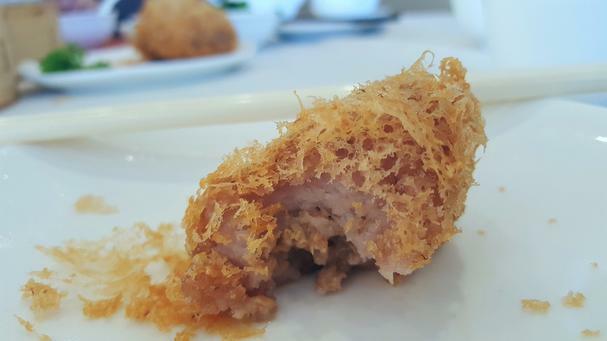 I also tried the Wu Gok, flaky, fragile bird’s nest looking dumplings that are filled with minced duck and mashed taro. One bite and they melt in your mouth! 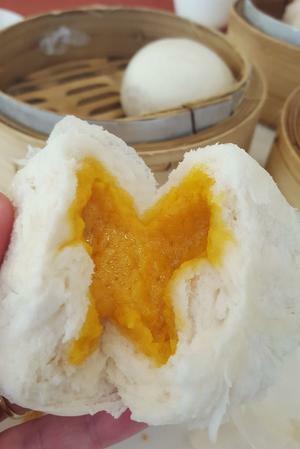 The sweet Salted Egg Yolk Buns (also called Salted Egg Custard Buns, at right) are a must-have dessert dumpling to begin your meal with. They're the perfect marriage of sweet and salty - neither which are cloying or overpowering. 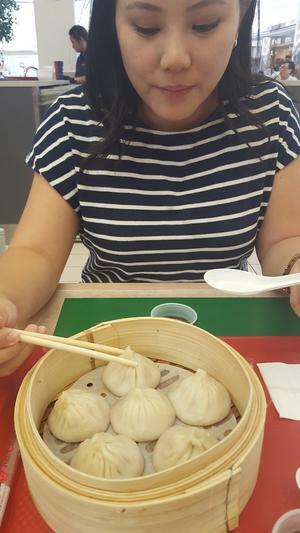 One cannot journey along the Dumpling Trail without experiencing Xiao Long Bao, or soup dumplings (also known as juicy dumplings). 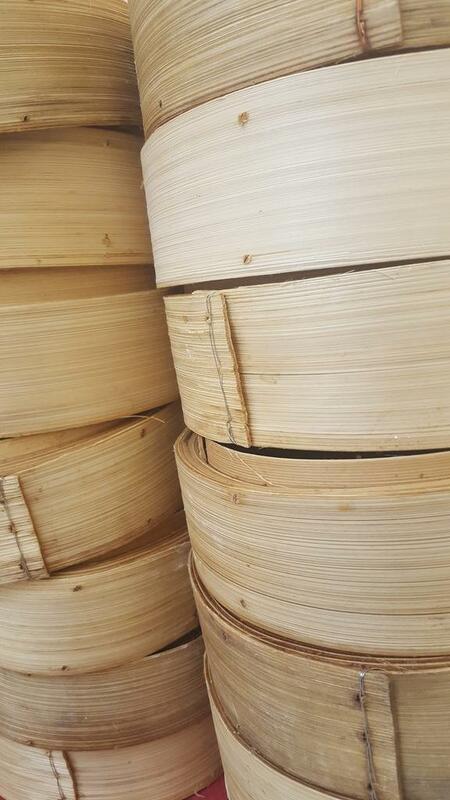 Xiao Long Bao hail from the Jiangnan region of China and are commonly associated with Shanghai cuisine. I headed to R & H Chinese Food located in the food court of the Lansdowne Shopping Mall where the soup dumplings are made to order. 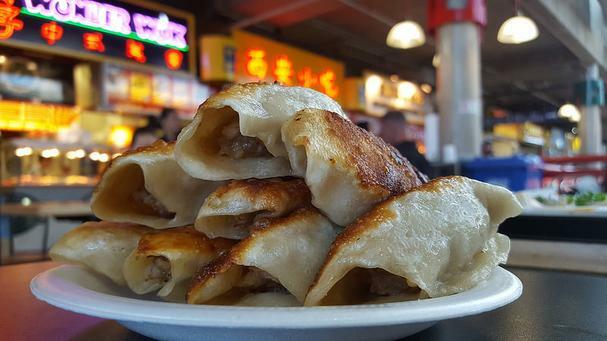 Yes, some of the best dumplings are found in the oddest of places! Eating soup dumplings requires a bit of practice and technique, neither of which do I possess. You must first bite a tiny hole in the side of the dumpling, then slowly and ever so carefully sip the hot broth from within. Not doing so can result in frying your mouth and dripping the precious contents within down your front. My three attempts proved successful if not somewhat painful. Dumpling Trail Tip #4: Don’t drive. Parking can be difficult or at best a nuisance, so opt for walking (you’ll burn off those dumpling calories!) or hop on the Canada Line. If you thought finding excellent dumplings in a food court a fool’s errand, you’ll be surprised when I tell you the next stop in my successfully delicious eating adventure was in a building shared with a car wash. Don’t be tempted to turn around when you approach this nondescript hole-in-the-wall. It’s not fancy, but chef/owner Takeo Sato is known to dish up some of the best ramen outside of Japan, and his pork, prawn and scallop gyoza (potstickers) are nothing to sneeze at either. 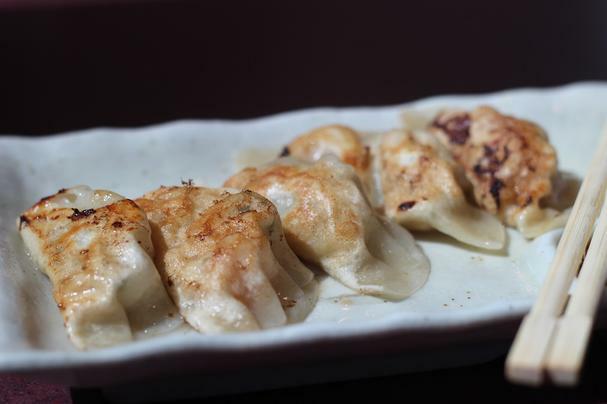 A plate of 6 small gyoza can easily be gobbled up as an appetizer for one. I barely scratched the surface of Richmond’s Dumpling Trail and am eager to return to seek out the ones that remain on my tasting wish-list: Guo Tie (another type of potsticker), the classic Wonton Soup, sweet Jian Dui (sweet glutinous rice flour pastries coated in sesame seeds and filled with lotus or red bean paste), Ham Siu Gok (Cantonese egg-sized croquettes with a crisp crust and tender minced pork filling), Chiu Chow Fun Gor (filled with chopped peanuts, garlic chives, ground pork, radish, and shiitake mushrooms), and so many more. Enter to Win a 2-Day Dumpling Tour Trip! For information on the Dumpling Trail including all contest rules and regulations, visit the Dumpling Trail. Editorial disclosure: Foodista's travel and expenses were generously hosted by Tourism Richmond.